With All 6’s And 7’s only a week old, fans are already taking to YouTube for brand new Tech N9ne covers. One of the most popular songs to come off the record was “If I Could” featuring Chino Moreno and Stephen Carpenter of Deftones. Jthejuggla recreated the track with an impressive guitar cover that sounds pretty spot on. The alternative cover is a great example of how diverse Tech N9ne’s fan base has become in recent years. 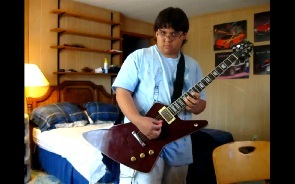 This young fan may not be a member of Deftones, but he certainly has plenty of skill to show off. What did you think of Jthejuggla’s guitar cover? Could you do something like this?